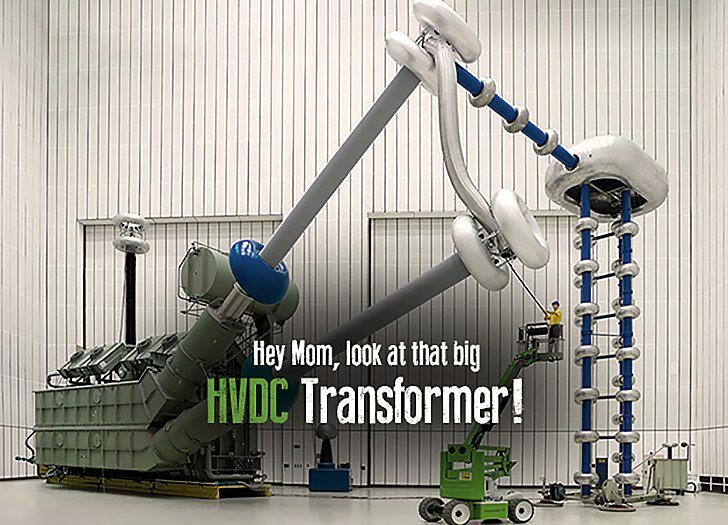 Hey Mom, look at that big HVDC Transformer! 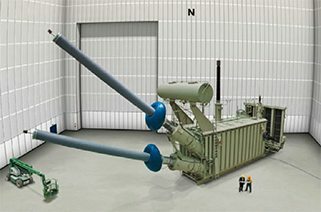 Home / Technical Articles / Hey Mom, look at that big HVDC Transformer! 800,000 volt transformer for high-voltage direct current transmission. The core of the system are ten transformers for voltage of 800 kV. They are each as large as a house and weigh 350 tons. 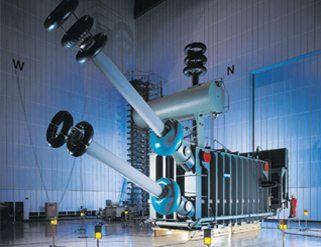 The photo shows the first ready-to-ship 800 kV transformer during electrical testing at the Siemens factory in Nuremberg, Germany. HVDC transformers are key components of HVDC stations. HVDC converter and inverter stations terminate long-distance DC transmission lines or DC sea cables. This type of transformer provides the interface between AC grids and high power rectifiers and are used to control the load flow over the DC transmission lines. These actors adapt the AC grid voltage to an adequate level which is suitable for feeding the valve system of DC converter and inverter. The design concept of HVDC transformers is mainly influenced by the rated voltage, rated power and transportation requirements like dimensions, weight and mode of transportation. Many large power HVDC converter station are located in rural areas of low infrastructure. Frequently, special geometrical profiles have to be fulfilled in order to move such transformers by railway. Typically, HVDC transformers are single phase units containing 2 winding limbs. This concept can include either 2 parallel valve windings (two for delta or two for wye system, figure 1) or two different valve windings (one for delta and one for wye, figure 2). In order to reduce the total transportation height frequently the core assembly includes 2 return limbs. Due to redundancy requirements in HVDC stations 3 phase units are quite uncommon. The valve windings are exposed to AC and DC dielectric stress and therefore a special insulation assembly is necessary. Furthermore, special lead systems connecting the turrets and windings have to be installed in order to withstand the DC voltage of rectifier. Additionally, the load current contains harmonic components of considerable energy resulting in higher losses and increased noise. Above all, special bushings are necessary for the valve side to access upper and lower winding terminals of each system from outside. Conclusively, two identical bushings are installed for star or delta system. In addition to the standard parameters of power transformers, special performance requirements have to be known for the design of HVDC transformers. Seismic requirements have to be considered for mechanical strength of turrets, outlets and bushings. Am impressed at the level you go to educate and enkindle our passion for electrical engineering freely. I wish I can get the Siemens HVDC presentation video. Yes, Edvard, that transformer really impresses!